We conduct seminars throughout the North Carolina Community College System. To find a seminar of interest near you, please check the schedule below. Seminar descriptions (Business Development & Personal Development) follow the schedule below. The New Business Development Series is designed for individuals considering starting a new business. Upon completion of this series, participants should be able to conduct research, determine the feasibility of their business idea, and develop a formal business plan with the assistance and guidance of their SBC counselor. Introduction to the North Carolina Small Business Network The Small Business Center is part of a statewide network designed to promote and support small business ownership and success. The SBC is committed to assisting in the development of new businesses and the growth of existing businesses by being a community-based provider of free and low-cost training, counseling, and resource information. This PowerPoint presentation can be easily customized for individual colleges, and is available to all Small Business Center Directors at no charge. How to Start a New Business / 500 Home Based Ideas Starting a small business requires determination, motivation, planning and know-how. One of the safest ways to start a new business is to start out working from home. Not only will your overhead be low, it gives you an opportunity to try out your idea before plunging in. This seminar is designed to help you determine if you are ready to start your own business, and if so, learn just what it is going to take. How to Write a Business Plan - - - the most important part of starting a business The most important task in starting a new business or growing an existing business is the business plan. No lender will discuss financing without one. Without a well thought-out, written business plan many small businesses may be doomed to failure. This seminar is designed to explain exactly what goes in to a business plan, why, and how to properly manage from it. For those who decide to continue, your Community College Small Business Center counselor will work with you on a one-on-one basis until the plan is complete. How to Finance a Small Business - - - and not running out of money You have decided that your idea is sound, but you need money to get started; or, you might need additional capital to finance growth. 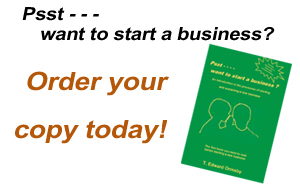 The business plan will tell you how much you need, and for what it will be used. This seminar is designed to show both prospective and existing small business owners how to determine how much they need, plus how and where they might get it. How to Improve Your Credit Score - - - so you can get a loan In order to qualify for financial assistance, a small business owner must have acceptable credit. And a good credit score can save thousands in interest costs. This seminar is designed to explain the mystery of credit reports and scores to small business owners and others, and give ideas of improving them. No matter what your score, there is always room for improvement. If you desire, your small business center counselor will assist you in understanding your report and beginning to improve your score. How to Market a Small Business - - - attract customers and clients You can have the best products and services in the world, but unless prospective customers and clients know about you, your business will fail. This seminar is designed to assist new and existing business owners in learning ways of identifying and reaching their target markets, in creative and cost-effective ways. Different businesses require different tactics. Find out what will work for yours. Introduction to Social Media Marketing - - - the new way of communicating While many believe that social media networking actually started in 2002 with Friendster, it was several years later before business owners recognized the value of using such social networking sites to promote their products and services. Today, there are virtually hundreds of social media sites. This seminar will explain this new marketing phenomenon, and show participants how to determine which ones might be right for promoting their businesses, and how to go about setting up a social media marketing plan. Licenses, Recordkeeping and Tax Issues for Small Businesses - - - the most boring part of owning a business Many businesses require permits and licenses from local, county, state and even federal agencies. Federal and State tax requirements are not the only reason to keep good, up-to-date records in your business. While the last thing you want to do is have the IRS or State Department of Revenue hassling you, good recordkeeping habits will allow you to focus on generating revenue rather than worrying about catching up on your bookkeeping. Both new and existing business owners will benefit from this seminar. Introduction to Nonprofits and Grant Writing - - - serving yourself and others Setting up and managing a nonprofit organization is very different from a for-profit business. There are literally millions of dollars available through both government and private agencies and foundations for non-profit entities. Identifying those that might apply to your specific business is important. Understanding and following their individual requirements, however, are essential to successful presentations. This seminar is designed to explain and prepare you not only setting up a nonprofit business, but also for the grant proposal process. Anyone new to the grant writing process should attend this seminar. Can management skills and leadership really be learned? The answer is YES! Superior leadership in managing and developing others is very important for small business owners. Not only will they strengthen employee morale, but also increase productivity and resulting profitability. These seminars are designed to give small business owners the tools they need to deal with people and situations in both business and life. Leadership Development for Small Business Owners Everyone is a leader - - - most just don't realize it. Small business owners must be good, effective leaders if they want to maximize the performance and development of their employees. This seminar will help participants recognize the leadership qualities that they already possess - - - and those they may not - - - and how to develop and utilize them effectively to maximize the performance of both their associates and business. In addition, it addresses such topics as dealing with difficult people, managing conflict, motivating and team building and more. Empowerment Through Coaching Coaching is the activity of developing the abilities of others. A successful coach will not only stimulate others to define challenges, but to develop their own options for meeting them - - - and become effective leaders themselves. In this free seminar, small business owners will learn the techniques for successfully developing their employees' confidence and performance. Time and Stress Management for Small Business Owners Some of the greatest drains on productivity occur when time is spent on insignificant tasks or trying to figure out what to do. Also, experts estimate that eighty-percent of meeting time is wasted on non-relevant topics. This seminar will expose small business owners to methods of recognizing time wasters and making better use of the time that they have available. Time pressures can often result in considerable stress, too - - - both physical and mental; and it can affect the performance of employees and associates also. Participants will also learn methods of handling and reducing stress. Attaining Business Excellence Business excellence occurs when a business consistently executes effective and strategic steps that lead to goal achievement. A business' success is dependent on the leader understanding that to attain true excellence, he/she must include management, employees, customers, clients and supplier interests in this quest. This seminar is designed to show business owners how other successful firms successfully attain excellence in their organizations. This seminar is combined with "Ethics in the Workplace" below. Ethics in the Workplace Workplace ethics refer to choosing the options that are determined to be the moral or legal "right" choices, even if other alternatives are very attractive, and even if you can "get away with" less ethical choices. Organizations that support ethics initiatives consistently show more productivity and employee retention than organizations that consider company ethics merely an issue of compliance. This seminar explains the meaning of business ethics, the cost of abuse, and ways for companies to avoid such breaches. It can also be formatted for employees and associates who need to understand their employer's position on this important issue and the possible consequences of abuse. This seminar is combined with "Attaining Business Excellence" above.